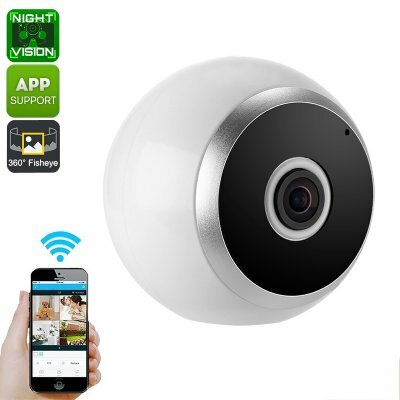 Successfully Added 360-Degree IP Camera - Motion Detection, Wireless, Night Vision, App Support, SD Card Recording, HD Resolution, WiFi to your Shopping Cart. Keep track of all what’s happening inside your property with this stunning 360-degree fish eye IP camera. With its 1/3-Inch image sensor, it produces highly-detailed HD security footage. The camera itself features a wireless design that allows you to place it anywhere within your home or office. This brings along high convenience and is guaranteed to upgrade the overall security levels of your property significantly. By supporting SD card recording (128GB max), your security camera can instantly save all footage for you to watch back at a later period of time. With WiFi support, this IP camera allows you to access its recordings and live-stream from afar. It comes with a dedicated mobile application that works on both iOS and Android phones. Thanks to this, you’ll always be able to see what’s going on in your property even when you’re not physically around. From now on, you’ll constantly be up to date on the security status of your home or office. This guarantees that not a single unwanted visitor will ever enter your property unseen again. Thanks to its night vision support, your property will be protected around the clock. Whether it is day or night, this 360-degree IP camera will keep your belongings safe at all times. Dual-Way audio communication allows you to talk to possible intruders or visitors from a distance. Your camera features motion detection and a full 360-degree view to make sure that not a single movement stays unnoticed. With this IP camera at your side, you’ll be able to leave your property with confidence. This 360-degree camera comes with a 12 months warranty, brought to you by the leader in electronic devices as well as wholesale IP cameras..
Arabic: - الكاميرا الملكية الفكرية فيش 360 درجة - Chinese Simplified: - 360 度鱼眼网络摄像机 - Czech: - 360 stupňů Fisheye IP kamera - Danish: - 360 graders fiskeøje IP kamera - Dutch: - 360 graden Fisheye IP-Camera - French: - 360 degrés Fisheye IP caméra - German: - 360-Grad-Fischauge IP-Kamera - Hebrew: - מצלמת ה-IP של פישאי 360 מעלות - Hindi: - 360 डिग्री Fisheye आईपी कैमरा - Italian: - Telecamera IP Fisheye a 360 gradi - Japanese: - 360 度魚眼レンズ IP カメラ - Korean: - 360도 어 안 IP 카메라 - Malay: - Kamera Fisheye IP 360 darjah - Norwegian: - 360 graders Fisheye IP kamera - Romanian: - Camera de ochi de peşte IP 360 de grade - Russian: - 360 градусов рыбий глаз IP-камеры - Spanish: - 360 grados de la cámara Fisheye IP - Thai: - กล้อง IP อาย 360 องศา - Turkish: - 360 derece balıkgözü IP kamera - Vietnamese: - 360 độ Fisheye IP Camera.